Weave in the ends of your shawl, but do not trim off the ends. Then soak your shawl in lukewarm water for 15 minutes rinsing it gently afterwards. 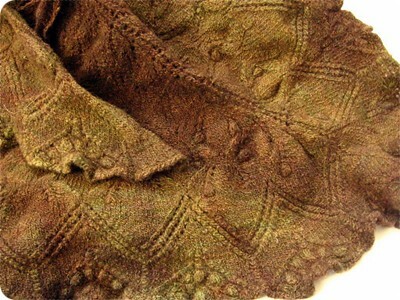 Wrap your shawl in a spare towel to blot out as much water as possible. Do not wring your shawl. Pin it out and leave it to dry for a few days. Unpin, weave in ends, then wear with love and pride. I was told in no uncertain terms by a series of people that I was wrong. Instead of soaking shawls in lukewarm water and then patting them dry, I should put them into the washing machine to spin them before pinning them out. I don't mind being told that I am wrong, but this advice ran so counter to logic that I decided to experiment a bit. In the name of knitting science I grabbed my Mosswell, my version of Elizabeth Freeman's fabulous Aeolian Shawl from Knitty, and I put it in my washing machine. I chose the absolutely lowest setting possible on my machine and the absolutely gentlest spinning cycle - and then I hoped for the best. No, the photo is not blurry. My shawl felted quite dramatically and is now roughly the size of a bib. So, what went wrong? I shall stick to my guns and say: "the washing machine is what went wrong". Unless you have a really state-of-the art washing machine (perhaps? ), I would stick to soaking your shawl in the sink/tub and patting it dry with a towel. You have much greater control over the process than if you were to just stick it in a washing machine and hope for the best. Also, if you have spent 2 weeks to 6 months on knitting a shawl, why not spend another 20 minutes (of which 15 minutes is the shawl soaking and you drinking coffee) on preparing it for blocking? Have you any experiences with blocking that you would like to share? Leave a comment - I'd love to hear from you! On Tuesday, northern Norway experienced a strange light show. No, the photo you see on your left is not a Photoshopped image. It is the real deal. But what caused this bizarre phenomenon? Bad Astronomy can tell you (incidentally, if you are not following the Bad Astronomy blog, do so! It is great). All that aside, my first reaction was: "Oh my giddy aunt, northern Norway? Philip Pullman got it right!" This reaction was quickly followed by: "Northern Norway? Wonder if there is a Bad Wolf Bay close by..? Oh no, not Rose again?!" And then I realised that maybe I am a bit of a geek after all.. Speaking of which, we watched Duncan Jones' Moon the other night. I enjoyed it, although it did not move me (but I do not think the film intended to move me and I appreciate that). A man stuck on a lunar mining base with a three-year contract about to run out, a robot to keep him company and an unreliable video link to Earth. Space is not a brilliant, adventurous place. It is lonely, cold and remote and it forces people to address questions about human identity, the frailty of memory, and the relationships between Man and Machine. Maybe this sounds dry, but Moon is a good film. Recommended. Oh, and the new Drops Summer Collection has just been unveiled. Voting decides which ones will be given full translation priority, but I just enjoy looking at the patterns. A few look interesting, but, really I'm not that bowled over. Perhaps it's because it's not even Christmas yet and they are talking about summer designs?! Those Who Cannot Remember the Past..
.. are condemned to repeat it. Or, in other words, try reading this news article about Switzerland banning minarets, replace the words "minaret" with "synagogue" and "Muslim" with "Jewish" and then ask yourself what it reminds you of? A simple semantic trick, but a very useful one. Meanwhile, I have become slightly addicted to Galaxy Zoo. When Earth becomes a bit too much, it's nice to disappear into space. Literally. Science ponders "Zombie attacks" (BBC). It sounds wacky but apparently it can help scientists understanding virus pandemics. I knew my good friend M. (an international expert on infectious diseases) would eventually come up with a really good explanation for his zombie film collection.